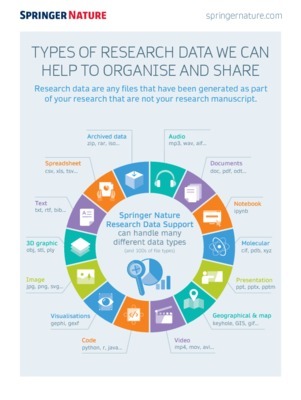 Infographic highlighting some of the key findings and elements of the Springer Nature whitepaper 'Practical challenges for researchers in data sharing'. We are a global publisher dedicated to providing the best possible service to the whole research community. We help authors to share their discoveries; enable researchers to find, access and understand the work of others and support librarians and institutions with innovations in technology and data. We use our position and our influence to champion the issues that matter to the research community – standing up for science; taking a leading role in open research and being powerful advocates for the highest quality and ethical standards in research. We advance discovery by publishing robust and insightful research, supporting the development of new areas of knowledge and making ideas and knowledge accessible around the world.